Boy, Month 1 of the GI Joe Collectors' Club Figure Subscription Service had a definite theme going on, didn't it? For a man known for his sense of humor, Airtight has one of the most deadly serious jobs on the GI Joe team. As the Chemical, Biological, Radiological and Nuclear Specialist, he stays well versed in the use of non-lethal chemical weapons in counter-insurgency. However, his main focus is the survivability of his team in hostile environments. he always operates in full mask and over garments, as if the MOPP (Mission-Oriented Protective Posture) threat level is 4. If the situation turns toxic, he would rather be already geared up to continue the mission, rather than waste precious time searching for decontaminated kits or nerve agent antidotes. 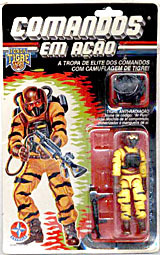 Airtight has been sent on a top secret Tiger Force mission to the jungles of Brazil, where radioactive materials have been detected in bodies of water intended for human use. Whether it is caused by sloppy weapons of mass destruction, man-made microorganisms or diseases, of the manufacture of illicit chemical substances, this one-man hazmat team intends to shut it down and clean it up fast. So the first two figures sent out for this year's Figure Subscription service are both Tiger Force repaints - maybe they're planning to build up excitement as they go? 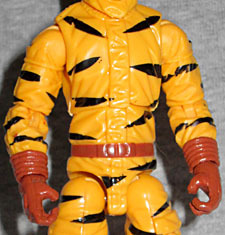 Airtight, like fellow month-one release Shipwreck, never actually appeared in Tiger Force during Generation 1; rather, he's based on a Brazilian character called "Ar Puro." "Let's see who can hold his breath the longest!" That was Ar Puro's favorite prank when he was child. Of course, he always won! When assembling their elite squad, the commandos learned of a guy who made the record books: 10 minutes without breathing! It was none other than the young Ar Puro, who then led a movement against environmental pollution, making a sort of "strike for breath!" Today, Tiger Force - the elite squad composed of super commandos for missions that require superhuman ability - can breathe easy, because they have a companion that makes Cobra "lose their breath!" While Tiger Force Shipwreck at least got new arms, Tiger Force Airtight is just Renegades Airtight with different colors. That's a fine choice, for several reasons: to begin with, Airtight was not an easy figure to find; if not for the delay in movie toys that forced stores to actually put toys out instead of reselling them to discount chains, most people would never have even had a chance at him. And secondly, he wears a specifically designed CBRN uniform, so all the pieces need to look like they belong together. He has sculpted ridges on his gloves and pads on the back of his hands. The sculpt of the body honestly does make it look like he's wearing hazmat gear, or one of those static-free numbers that computer technicians wear when working with super delicate electronics. In addition to the brown vest with its black technological pack on the chest, he's also wearing brown gloves and boots, and has black tiger stripes on his yellow uniform. His helmet is brown with black details, a clear visor, and a green nuclear symbol on the back of the head. That's a neat little detail! In addition to the removable helmet and vest, TF Airtight comes with his backpack, hose and vacuum gun, as well as the Baur H-AR gun. The guns are grey, while the backpack is brown. 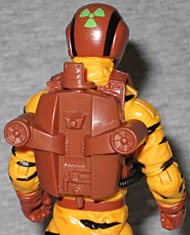 On Ar Puro, all the accessories were black - they perhaps should have retained that for the guns, but making the backpack match the vest was the right choice. 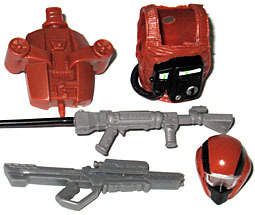 The Renegades release had a second air tank that this one doesn't include, but then, Ar Puro didn't have a rifle, so we're already ahead of the game. When the full line-up for Figure Subscription Service 2.0 was revealed, Airtight was near the bottom of the "want" list for me (so was Shipwreck, for the record). I was never into the Tiger Force figures as a kid, and I already had versions of the characters (the same reason I don't care much about the upcoming Night Force Falcon). The disinterest was especially high in Airtight's case, since his normal uniform is so close to the Tiger Force colors anyway. Getting him in hand has softened my apathy somewhat - thinking of him as part of a Brazilian special forces squad helps - but I'd still be willing to pass him on to someone more interested than myself.